“Separation anxiety,” from a behavioral point of view, is the same as any other behavior in that it is functional…it serves a purpose. What purpose does it usually serve? You ready? I have been unreasonably hesitant to write about “separation anxiety” for some reason. I openly talk to parents about it without problems, but I know it can encroach on some pretty sensitive grounds. However, I do feel BehaviorBandAid is missing something if we don’t talk about it. Here goes. For the purposes of this discussion, let me just say I am calling “separation anxiety” the crying, screaming, holding onto your left leg as you struggle (emotionally and physically) to get away behavior. Your kid is scratching at the window, running out the door, kicking and screaming while the babysitter is wondering what she got herself into. Misery. We talked about some of this when we talked about getting your kids to bed. This shouldn’t surprise anyone, even those with the problem. The function (read: “purpose”) of these behaviors is most likely regained access to you (assuming you are the one dropping them off or leaving them). On top of that, when you return, it is usually a more comforting, nurturing version of you. An extra few minutes, a few more good-bye kisses, a few more hugs, and a few more steps towards the door. Did you see what just happened above? Your kid does not want you to leave (a natural emotion) and crying, screaming and throwing a fit got you back to him. It was FUNCTIONAL. The emotional outburst was successful in getting him what he did not previously have…you. For those that really have this problem, these things rarely help. Your actions might even make it worse. You know this, you are simply hesitant to do what I am about to tell you to do. A teacher friend of mine has a saying about parent drop-off at her school in the morning. She sees plenty of kids struggling to get out of the car with their parents, and plenty of parents struggling to let their kids go. Her motto is: stop (your car), drop (off your kids) and roll (the hell out of the parking lot…see you at 3:00). If the problem is leaving your kid, create a good-bye routine. Two high fives, a knuckle-bump and a hug, then you are out. Practice it at home. Leave her in her room and play like you are leaving at school or with a babysitter. Let her know you will be back. Come back later, but don’t make a huge deal over it…just tell her you will always be back. Practice this…this is as much for you as it is for your kid. Do it as much as possible, even at times when you are leaving when she usually does not have the problem. This is what you do when you leave…every time. On the way to school remind them of the “good-bye” deal. Let them know you are into it. When you get to school, do the good-bye routine and leave. LEAVE. Don’t come back. Please. Your kids are safe. If you do not trust your kid’s teacher, you have a bad situation and a bigger problem. If you do, your kid will be fine. Leave. 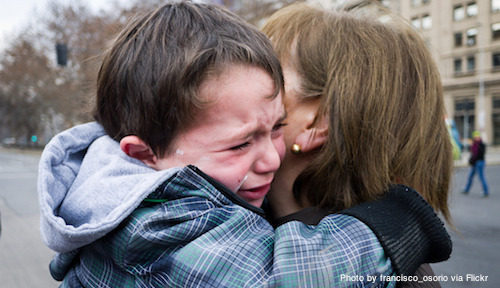 You don’t love your kid less, you are not torturing them, and no, one more hug won’t help. Put him down and leave…at this point it is about you…not your kid (OK, I said it). Please understand why I am asking you to do this. I am asking you to do this so you do not accidentally create a situation where your kid has more and more trouble being away from you and it actually turns into serious and real anxiety. You are a safe and nurturing place…that is good. That is the way it is supposed to be. But, there are problems associated with your kid being dependent only on you for those things. Her happiness and security relies on you being there. Thats not good. It will potentially keep your kids from exploring other things and being able to enjoy times away from you. It will also exhaust you to the point where that one day, you finally say “thats enough” and you leave them in a complete mess at soccer camp, school or a friend’s house. Don’t create that moment…prepare your kids for being away from you. They will need that one day, and so will you. This entry was posted in Uncategorized and tagged anxiety, crying, school drop off, separation anxiety by BehaviorBandAid. Bookmark the permalink.